One of the highlights of Reunions '13: Reedfayre was Alumni College, a multi-disciplinary series of conversations and outings for Reedies of all ages. Aesthetics was the theme of this year's Alumni College #2 (which took place after Reedfayre), and school opened bright and early on Monday morning with a conference on Immanuel Kant’s Critique of Judgment (1790), led by Jan Mieszkowski [German 1997–]. Mieszkowski started the conference with a question that is central to Kantian aesthetics: what does it mean to say that an object is beautiful? 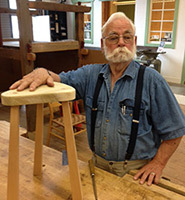 Naturally the gathered Reedies—including Harry Travis ’69, Lowell Weitkamp ’58, Carole Maxwell Stuart ’63, Monica Mayper ’73, and Chilton Gregory ’60—turned to the objects at hand: the stools they had built by hand under the tutelage of master woodworker Gary Rogowski ’72 the previous day. The group agreed that Chilton’s stool was particularly attractive, but Kant’s claim that a true aesthetic judgment was devoid of all interest provoked skepticism in some of the conference participants. Evolutionary biology, the Russian painter Wassily Kandinsky, and rose gardening were topics in the fiery debate on beauty and genius that followed.